2015 is in full swing and I’m sure there are many of you out there with several goals, resolutions, and things you want to work on this year. I am right there with ya with my own handful of self-improvement projects, but there is one thing that is taking priority right now. My health. Crazy right!? I exercise regularly, I eat lots of fruits and veggies, I try to practice yoga and stretch, what could I be doing wrong? I have recently been having some tummy and digestive issues that I have honestly dealt with for much of my life, because I just thought the random stomach pains, constant bloating and discomfort and “irregularity” was normal. Being part of the blogging community has exposed me to many people with many different ways of eating with many different reasons for these various ways of eating. These unique ways of eating are often due to health issues, and I honestly find that fascinating. That being said, as I read and learned about the personal lives of these other bloggers I started to get curious about my own digestive health. Now, I know there is a lot of crazy information out here on the internet so I wanted to make sure that I wasn’t just making things up in my head and that there actually was an abnormality. In the midst of my rising curiosity, the sporadic pain in my stomach started to get worse. The unpredictable pain and uncomfortable bloating really started to affect my quality of life and I felt I had had enough. That’s when I scheduled my first appointment with a gastroenterologist. (GI Doctor). At first, I was nervous, but excited to talk with someone who may have some insight about what was going on with me. The appointment went great. I felt as if I could have listened to all my doctor had to say about the foods we eat and how they affect our bodies for hours and hours. He was very knowledgeable and ready to help. As I suspected, I was “diagnosed” with IBS (Irritable Bowel Syndrome), which my doctor explained isn’t really a diagnosis because doctors are still unsure of the root cause of IBS. The first thing my doctor wanted me to adjust was my diet by eating low FODMAP foods. I received this diagnosis just before Thanksgiving. That meant there were holidays, lots of travel, recipe testing for the cook book, and not being 100% in control of all of my meals for a couple of months. I did my best to stay on track and not eat the high FODMAP foods, but I also tried not to stress TOO much (that can cause tummy troubles too!). I decided that when January rolled around I would dig in and finally eat low FODMAP for the suggested 6 weeks before integrating high FODMAP foods into my diet to see what my body would tolerate. 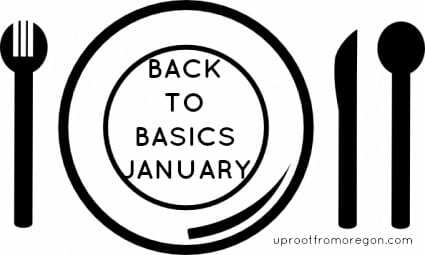 While I had been planning this low FODMAP January for a while, just a coupe of weeks ago Marisa from Uproot from Oregon reached out to me to tell me about her Back to Basics January. Seriously, she couldn’t have had better timing! So, I know this post is very wordy and not very “fun” but I wanted to share where I am at with all of you. 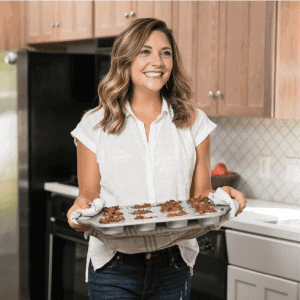 I’ll still be sharing recipes I try out, workouts I do and create, and other musings of my life just like you are used to. Now, I am definitely not an expert in this area, but if you have any questions for me I would be happy to answer based on my personal experience and knowledge but I think the most important thing I would like you all to take away from this post is to truly listen to your “gut” when it comes to your health. If something doesn’t seem right or normal (even if you’ve always felt that way) talk to a professional and get help. You will be so thankful and happy you did! I am so glad I stumbled upon your blog! This post is so relevant to me and my own personal digestive issues. I experienced random stomach pains, constant bloating and discomfort and “irregularity” ALL THE TIME. I finally went to the doctor in early November and was also diagnosed with IBS. Which is nice to know, but I feel like it’s sorta a cop-out since they really don’t know anything about it. Anyway, I was thinking about trying the low FODMAP approach and I am interested in following your journey and experiences to see how it works out! I’m glad you found me too!! Definitely talk with your doc before doing low FODMAP because everyone is different when it comes to the IBS stuff 🙂 Good luck! I have been having awful tummy issues for a while now and I am trying to do the low fodmaps diet. It works for me usually but there are still things that will set if off. I really hope I can get to the bottom of it. Good luck to you as well. Are you taking any supplements or anything for your tummy? Hi Hayley, my GI doctor actually prescribed a probiotic and peppermint extract for me to take and I think it’s helping but I have to go in for a follow up appointment. Good luck with your issues! I hope you keep us updated with how it’s going! I need to do something like this- got a diagnosis of IBS and never followed up on it. I’ve been feeling terrible recently. I will definitely keep you guys posted 🙂 Thanks for the support and good luck figuring out your tummy troubles! I am excited to see what kinds of recipes and/or activities work you Tara. Thanks for your support, Brittni! I’m sorry to hear about your tummy issues, Tara! Hopefully with a little bit of trial and error you will be able to manage and control everything so that you can be most pain-free. I suffer from acid reflux and I know what a pain (no pun intended) that can be. I am starting to look into doing somewhat of my own personal experiment to see if I can treat it naturally and get off of the medicine I have been taking for years. I know it cannot be good for my body! Tara: So happy to hear that you have found something to help with your tummy troubles. I hope that the process of identifying your triggers is easy + painless! Me too girl! I’m doing a low-FODMAP whole 30 right now to try and figure out what exactly is problematic for me once and for all – I’ve been avoiding all foods containing FODMAPs up to now and it’s not really practical as not all high-FODMAP foods are irritants for everyone. It’s super personal! Good luck with the Whole 30 🙂 I did it last year and really felt like I learned a lot about listening to my body and reading ALL food labels. ANd you are so right…the whole FODMAP thing IS super personal. I hope that you are able to figure out your triggers without too much trouble 🙂 Good luck!! !